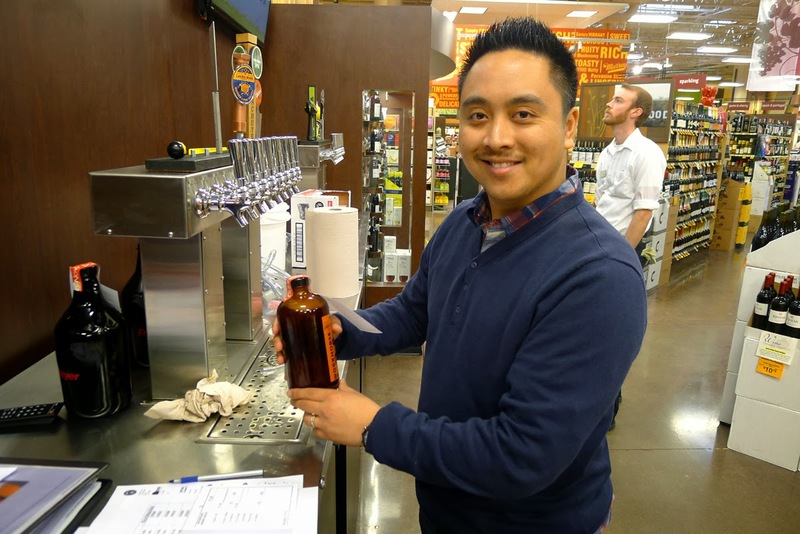 Fred Meyer this week launched growler filling stations in three of its busiest Portland stores: Burlingame, Hawthorne and Hollywood. I visited the Hollywood store Thursday evening and Friday, just as they opened the taps. This was a very soft opening. In fact, I'm Hollywood's first growler customer...a quart of Lucky Lab Super Dog IPA. Almost famous. Freddy's is entering the growler game on a virtual tsunami. Let me explain. 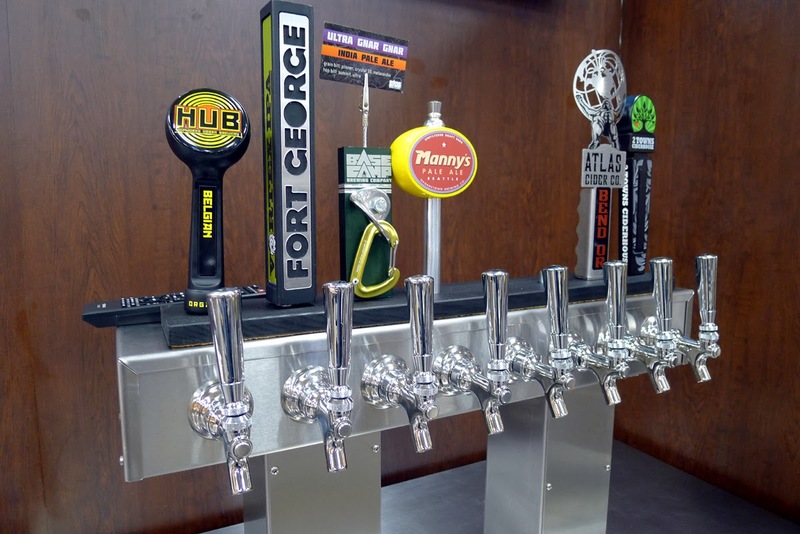 Places that fill growlers are popping up everywhere around town. And not just in town. A couple I met at Belmont Station told me about a store in Damascus that fills growlers. Damascus! The reality is, we are awash in these things. Not so long ago, it was considered chic and forward-thinking to offer growler fills. Now the idea is almost passe. You wonder where this is headed, how many of these places the community will support. But never mind. Hollywood Freddy's is an excellent target for the growler concept. The store is located on the fringe of the affluent Irvington neighborhood. They sell a boatload of wine here. Until the recent (2012) reset, this store was down in the dumps on the beer side. Not any more. They now have a great beer selection. And it sells. What they have now is 16 taps of craft beer and cider. When I arrived Friday morning, they were offering 14 beers and two ciders. The gent manning the taps (who preferred that his name not be used) said they will eventually add kombucha and maybe a couple of wines. That mix would be similar to what I've observed at Whole Foods locations, though most of those stores have fewer taps. Freddy's will fill clean 32 and 64 oz containers. Bring in a bottle that smells like a dead raccoon and they won't fill it. If you don't have your own container, they sell standard 64 oz growlers for $4.99, not a bad deal. They will likely be selling 32 oz grenades and stainless steel growlers at some point. Of course, this is Fred Meyer. They sell all kinds of containers, many of which would be perfect for beer. Pricing is on the high side in my estimation. My 32 oz grenade of Super Dog was $5.99, cheapest in the house. The highest priced full growler (two beers at this price) was $15.99 and the lowest (again, two beers) was $9.99. Not exactly cheap. Prices will obviously fluctuate with the beers, which will rotate quickly since they have mostly 1/6 barrel kegs in the coolers. I get that. But the list will have to be more spectacular to capture my interest at those prices. When you get your growler filled, the barkeep will attach sealant tape and a tag with a PLU#. Yes, this is similar to what you do when you put a number on a bag of bulk nuts or whatever. The tag also specifies whether the growler belongs to the customer or store. Now you take your growler (growlers, for the greedy) to checkout and it is handled just like bulk food. Pretty smooth. If I were installing a growler fill station in a store like this, I would want to ensure that it didn't cannibalize existing sales. Fred Meyers gets it. The gent I spoke to said they will address that concern by featuring mostly one-off beers that aren't for sale in packaged form. One of my industry sources had already told me that's what they were doing, but I'm stubborn...and nosy. As I mentioned near the top, and have mentioned in past posts on the proliferation of taprooms and growler fill stations, we simply do not know how many of these places the market will bear. Grocery stores entering the fray is a significant development. Competition is the reason. Because grocery stores do so much more volume than your average taproom, bar or convenience store, distributors are going to want to keep them happy. Now we have a situation in which behemoth stores are competing with taprooms and smaller growler fill locations for special beers. This is going to get interesting. 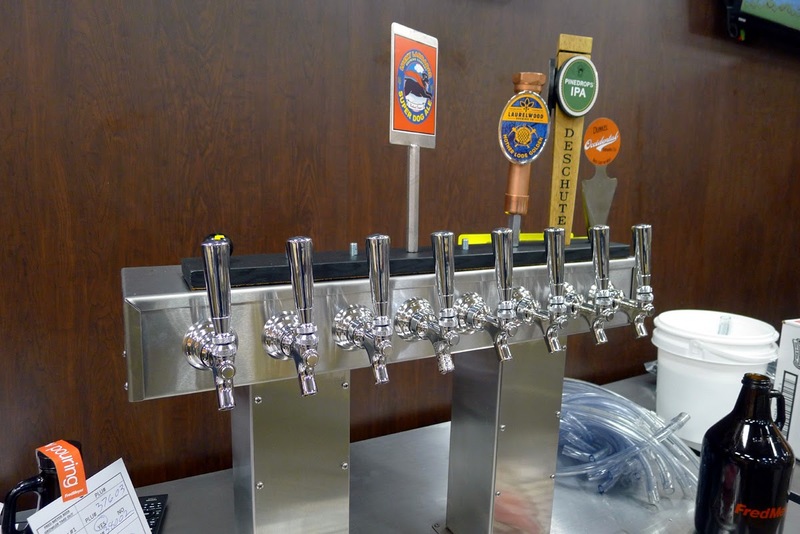 .I saw beer taps in WFMs and a Kroger in Columbus, Ohio, ~3 years back. This can not happen in Colorado without reversal of restricting grocers to no alcoholic beverage but 3.2% ABW beer. On the downside, this will likely take a toll on taproom. On the upside, this could add a few new craft beer drinks; if gateway craft beers are offered. Hey that's really cool. Have ya'll seen the TapIt Cap? It turns your growler into a mini keg and your beer really lasts! You don't have to drink it all in one sitting. I have one and really enjoy having a special draft beer and then another one in a few days. 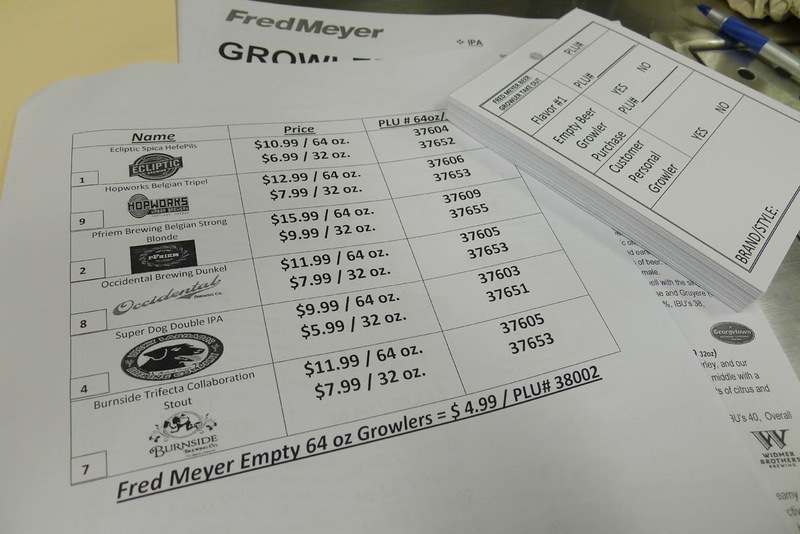 But being a Fred Meyer you won't ever be able to locate that growler fill station again as the stores' layouts are designed by the criminally insane. That said, that growler station out in Damascus is pretty damned good (selection & value). That's a good point on the insane layouts at FM. Think of finding the growler fill station as a game and you'll be good. I need to see that place in Damascus.